Install 4 IP Cameras in car parks, stations, shopping centres, retail outlets or indeed anywhere that has legacy coax cable and analogue cameras that you want to upgrade to IP Video cameras. Four IP cameras can reliably be used over one coax cable. HIGHWIRE Powerstar Quad makes the most of your legacy cabling and multiplies its capability by connecting up to four IP cameras or other network devices. 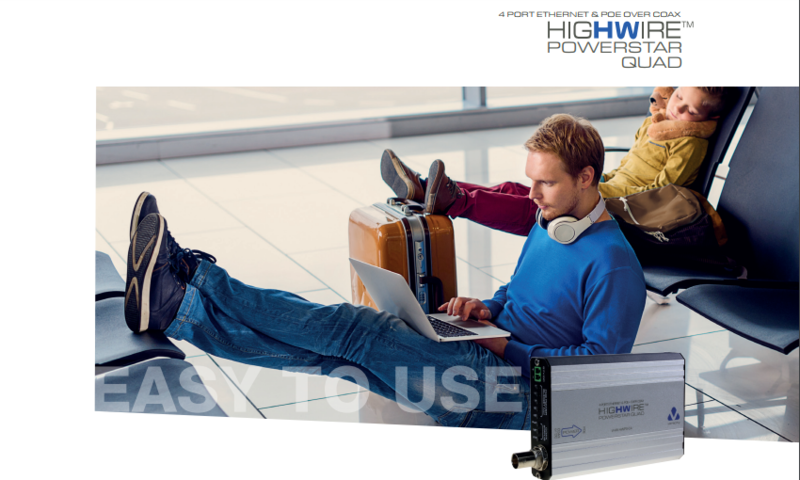 HIGHWIRE Powerstar Quad’s unique ultra low-power design and efficient power delivery enables long range Ethernet over coax. It works even over the lowest grade cable, such as the high-resistance, copper-clad steel (CCS) types found in many legacy installations. This means that legacy coax upgrades can be planned with confidence, while a quick check of the SafeView power level display reaffirms that the device connections will continue to be reliable, whatever the cable used. For predictable network operation with no restrictions, HIGHWIRE technology delivers a full 200Mbit/s of bandwidth at 300m (1000 ft) of RG-59 or 500m (1600 ft) of RG-11 coax. For full information on POE-over-Coax distances achievable, please refer to the Range Table in the HIGHWIRE Powerstar datasheet or on the Veracity website. For POE power budget and power supply options, see the POE Power Budget Table opposite. The Quad variant of HIGHWIRE is designed for the camera end of the coax and, with an integrated two-port POE switch, enables connection of up to four IP cameras over a single coax. With no need to configure IP addresses, set DIP switches, or make awkward measurements and calculations, installing HIGHWIRE Powerstar Quad is simple. The Base end of the coax is driven by single-channel, 4-channel or 8-channel HIGHWIRE Powerstar Base unit. The Quad unit can be powered either by POE over coax, delivering a maximum total POE power budget of 25 watts, or by one of the optional local PSUs, delivering 40 or 78 watts. Veracity’s unique SafeView display, to provide IP camera installers with an instant and very easy-to-understand confirmation of correct operation from either end of the cable. In the simplest implementation the BASE unit receives power from a standard POE switch or Veracity’s 57V DC PSU and transmits POE over the coax. This is shown in the diagram below. The Quad unit receives this power and delivers up to 25 watts shared between four IP cameras. No external power cabling is required, and all detection and setup occurs automatically. For higher POE power budgets, an optional Veracity 57V DC PSU may be used to power the Quad locally at the camera end delivering 40 watts or 78 watts depending on PSU model. The diagram shows POE power delivery over coax from the Base end. The Powerstar Base unit may be powered by a POE or POE Plus switch, or for maximum power delivery over coax, by Veracity’s 57V DC PSU.